Fogarty Law Group PLLC represents businesses, public entities, and individuals in a broad range of civil disputes. Our varied litigation practice provides us with the opportunity to appear in state, federal and administrative actions. We also serve as local counsel for out-of-state clients. We are committed to helping our clients efficiently meet their goals. We offer competitive rates and are open to discussing alternative fee arrangements. We do not charge for computer-assisted research (Westlaw), domestic long-distance phone calls, faxes or photocopies, unless it is a large project. Dedicated. Fogarty Law Group PLLC is dedicated to providing all of our clients, big and small, with top-flight legal representation and client service. We are dedicated to providing a supportive work environment that fosters the professional development and growth of our staff and lawyers. We are also dedicated to making a difference in the community in which we live. Focused. Fogarty Law Group PLLC is focused on our clients' needs and objectives, whether those objectives are limited to the matter at hand or are more encompassing. Our years of legal experience, which includes large firm litigation practice and insurance defense, combined with our collaborative work environment uniquely positions us to focus quickly on the key issues and devise innovative solutions. Strategic. 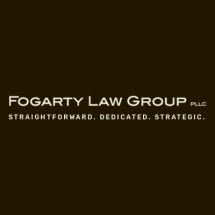 Fogarty Law Group PLLC is strategic in its approach to each case or client problem. We recognize that every case brings its own unique set of facts, legal issues, and client objectives. We are able to keep our eye on the big picture, while focusing on the critical details. Given our experience representing both plaintiffs and defendants in a wide variety of disputes, we can better evaluate the strategy deployed by the other side, to most effectively counter that strategy and to create leverage to achieve our clients' goals.